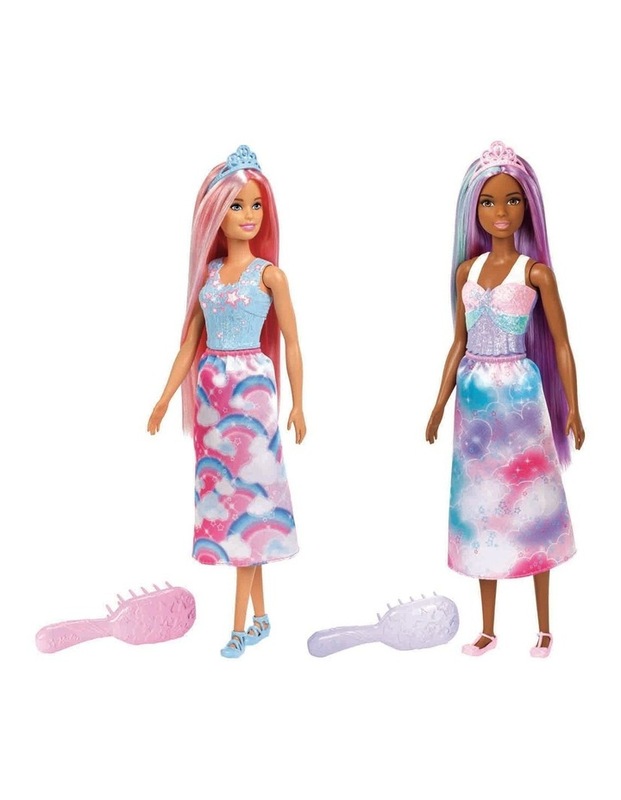 These Barbie Dreamtopia dolls help imaginations dream up new lands -- and new hairstyles! Each doll has bright fantasy-colored hair that's extra-long so it's extra-fun to brush -- a hairbrush that's easy for small hands to grasp is included! Barbie princess dolls wear fantastical outfits with colorfully decorated bodices, skirts with rainbow-inspired prints and matching shoes -- a tiara completes each look with fantasy flair. The removable fashions encourage styling and fantasy fun, making these long-haired dolls great gifts for younger kids. Collect all the Barbie Dreamtopia dolls and toys to recreate favorite scenes or tell your own fairytales and sail away with Chelsea and her big sister Barbie (each sold separately, subject to availability).